Microsoft has come out swinging with its first ARM-based tablet, but does it live up to all of Microsoft's promises? Back in June, Microsoft unveiled the Surface tablets, one based on the popular ARM architecture seen in most tablets and smartphones and one based on the standard Intel/AMD x86/x64 architecture seen in nearly all PCs. 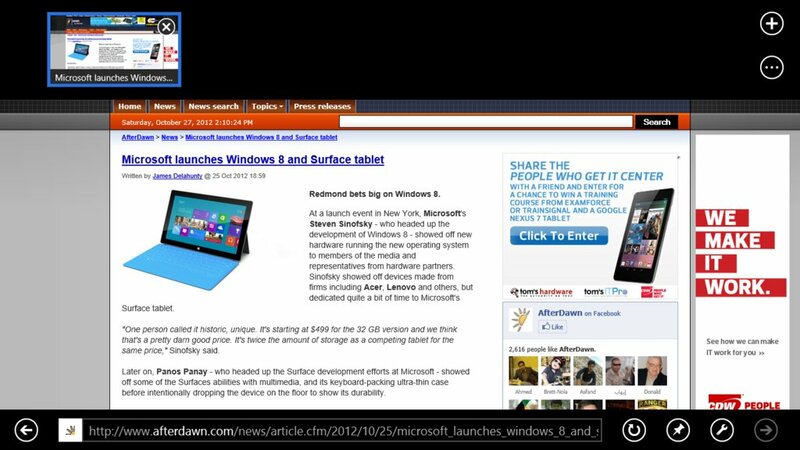 The first to be released is the ARM-based device, which features its own form of Windows 8 dubbed Windows RT. The device is priced equal to the Apple iPad and higher-end Android tablets but it is being branded as more than just a tablet, it is being branded as a desktop/laptop replacement. In this review, we will discover if Microsoft has lived up to that promise. I'll say this outright; the Surface's design is one of the nicest I've ever seen on a tablet. The company used a magnesium alloy for the entire body of the tablet, which gives the device an extremely sturdy and sleek look. From all angles, the device has a sharp look, with neatly placed buttons, a Microsoft logo and a small strip of plastic to house the rear-facing camera. The kickstand is the same color and has an enjoyable "woosh" noise and click letting you know it's not just some cheap piece of plastic. On the front, the glass screen is massive, and there is little else but some bezel, a front-side HD camera and the capacitive Windows button in the center which takes you back to Live Tile mode when you are in desktop mode. 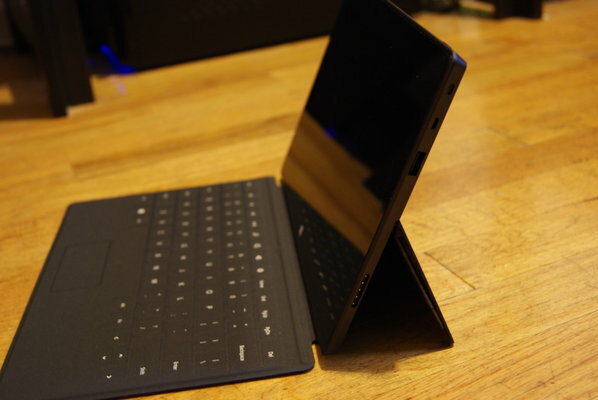 For some reason the MicroSD slot is hidden under the kickstand, but at least there is one unlike other tablet. Perhaps most annoying of the design is the proprietary charging port, which is magnetic but doesn't necessarily work well, at all. Microsoft should have opted for a standard charging port. The tablet is somewhat heavy, (or at least it feels that way), for something that weighs just 1.5 pounds. It is also very large. The dimensions are 10.81 x 6.77 x 0.37 inches, with the display being a workable 10.6 inches, larger than any other popular tablet on the market, most of which feature 9.7-inches or 10.1. That being said, Microsoft seems to have created the tablet to be docked with a keyboard, rather than being a comfortable tablet experience. This is unfortunate because trying to use the kickstand on unsturdy surfaces was an effort in futility for the most part. If you don't plan to use the cover as an actual keyboard, the on-screen keyboard works as you would expect it to, very well. Better so, than iOS', in my opinion, but not as good as a Jelly Bean packing Android device. On the design side, the tablet is gorgeous, especially when compared to tablets like the Kindle HD Fire and Nexus 7. The design and feel live up to the iPad, and that is saying a lot. However, the size of the tablet begs for a desk and a dock, taking away some of the fun of having an actual tablet. Under the hood, the tablet is powerful. There is a quad-core NVIDIA Tegra 3 T30, 2GB of RAM, 802.11a/b/g/n Wi-Fi and Bluetooth 4.0, 32 or 64GB of internal storage, capacitive pen support, an ambient light sensor, accelerometer, gyroscope, and compass. The specs are nice, simple as that. 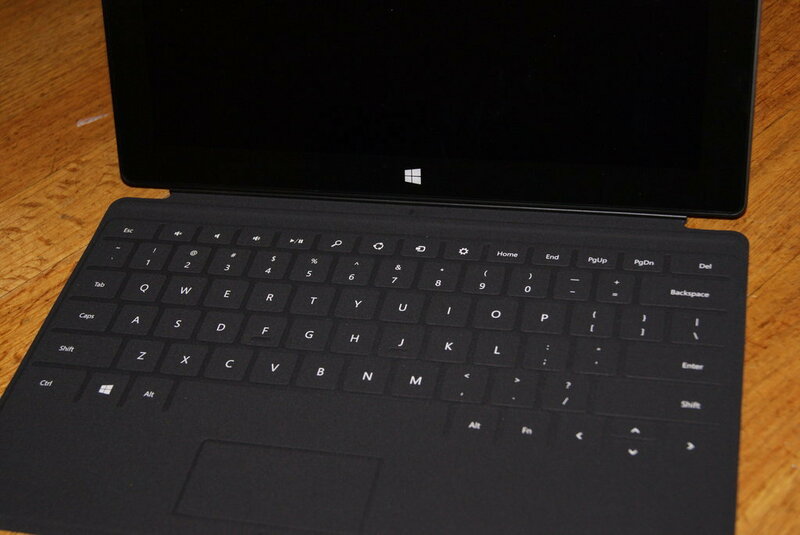 The Surface features a 10.6 inch ClearType display running at 1366 x 768 with 5 point multi-touch. The display is 16:9, making landscape the preferred way to use the tablet. In fact, trying in portrait is actually pretty awkward. Microsoft's own ClearType tech is supposed to make colors crispy, as well as the typography, even though the resolution is not huge like the iPad's Retina Display or other 1080p displays. The tech lives up to its hype, as the screen is fantastic on the Surface. The blacks are black and the colors are extremely rich and crisp. However, a screen of this size needs at least 1080p and it's not there. Touch response was fantastic, although Microsoft made some mistakes with the software, like X-ing out of some windows in desktop mode were harder than they should have been due to being too small for accurate touch. The multitouch and gestures all worked as they should, as well. The Surface features dual cameras, both being 720p. There is no flash, or autofocus, and taking pictures with a tablet this size is nonsensical. For Skype and video, the cameras worked just fine, and the tablet's size came in handy at that point. Otherwise, the pictures were very low resolution and extremely grainy. It's nice the tablet has two cameras, but outside of Skype, they are pretty useless. Battery life was awesome. For average use including Web browsing, some video watching, some Skype chatting and a bunch of Twitter checking, I was still able to get over 8 hours. The battery life was similar to that of the iPad, which is a good thing. This can be attributed to the optimization for ARM, and battery life will likely suffer a bit when the Intel-based Surface Pro comes out next year. However, battery life was very impressive with the Surface RT, as promised. I had no issues with the performance of the tablet, as a whole. The UI was very responsive, and the Live Tile interface was really, really fast and efficient. The startup was a bit slower than I expected, but that could be me being spoiled by Jelly Bean. All of Microsoft's apps were great, with the exception of the Games and Store live tiles, which seemed to hang forever when opening, for no reason. The Mail app seemed slow at first with only Gmail and Live connected, but I have had no issues since the very beginning. I have not tried too many third-party apps of yet, but most have worked very decently, including Hulu Plus and Netflix, although the playback quality was not perfect, yet. 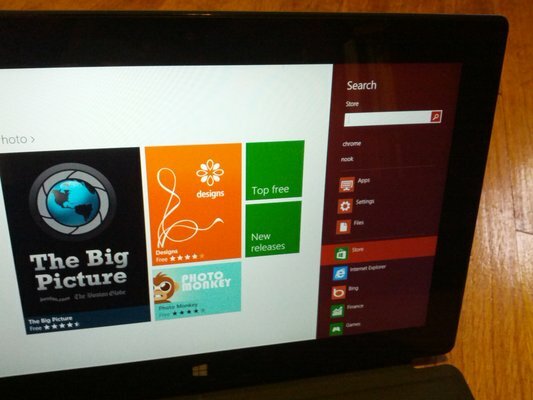 The Surface did not like Flash video while in Internet Explorer 10, nor did it like some HTML 5. However, this was not a big problem as general performance was very good, if not without bugs. Windows RT itself is awesome. The Live Tile interface is great, in my opinion, and it is very easy to get to Desktop mode or any application you are looking for. It's also very easy to re-arrange your apps to match your needs. There are Windows power tools, as well, and of course, there is Paint, which is actually pretty fun to use on a tablet. The OS in desktop mode is almost exactly like using a standard Windows 7 machine except that there is no Start bubble. If you can get over that fact, that the OS runs through the tile interface, it is very aesthetically pleasing and usually a joy to use. Internet Explorer works in full desktop mode as it would were you using a computer, and works more like the Windows Phone version of itself when in the tile mode. All of the apps are decently intuitive, but Microsoft really does not make it their priority to explain how things work, especially those that require gestures. This may not sit well with all consumers. The Office Preview, while we wait for the full release next quarter, is great. It is everything you expect from a productivity suite, and is much better than alternatives on Android and iOS like QuickOffice HD. Microsoft knows this and exploits it well, tabbing the programs in Desktop Mode and making them Live Tiles right out of the box. Despite being a complete joy to use, Windows RT may actually be the downfall of the tablet. Microsoft has placed draconian restrictions on the operating system, including blocking other browsers that are not Internet Explorer. For someone who uses Chrome and syncs Chrome across all their existing devices, this is just not acceptable. Additionally, Windows RT cannot use the hundreds of thousands of Windows apps that previous OS owners enjoy. You can only download and use games created for Windows RT and its Metro style. For now, the app and game catalog is small and while it will improve over time, there is no incentive for rivals like Google to make their popular apps like Google Music, Drive, etc. available on the Surface RT anytime soon. These restrictions make you feel blocked out, and completely breaks Microsoft's promise of the tablet being a desktop/laptop replacement, which is unfortunate. Another thing to keep note of is, your 32GB Surface, because it is running Windows, will actually give you just about 16GB of actual space on first boot, which is disappointing. The Touch Cover is brilliant. The cover connects very easily, and magnetically, to the bottom of the tablet and doubles as a full keyboard and protective cover. It works extremely well as both, as well. Despite not having actual movable keys, typing was easy although not "satisfying." I found myself checking what I had written more than usual to make sure there were no mistakes although there were rarely any. The mouse touchpad also worked shockingly well, moving wherever I moved it with no lag. The main issue with the cover is using it anywhere that isn't flat or sturdy. Trying to write while on a train was hard due to the tablet being much heavier than the Touch cover and having to try to hold down the keyboard while typing with the other hand. Not fun. All that being said, however, I would recommend getting either the Touch cover or the Type cover if purchasing a Surface as it enhances the experience significantly. I had extremely high hopes for the Surface, as I have been looking to replace my current ultrabook with a tablet hybrid that has superior battery life, a touchscreen, and can also live up to the productivity needs of my everyday life. The Surface with RT is a fantastic tablet, with one fatal flaw, and that is RT itself. 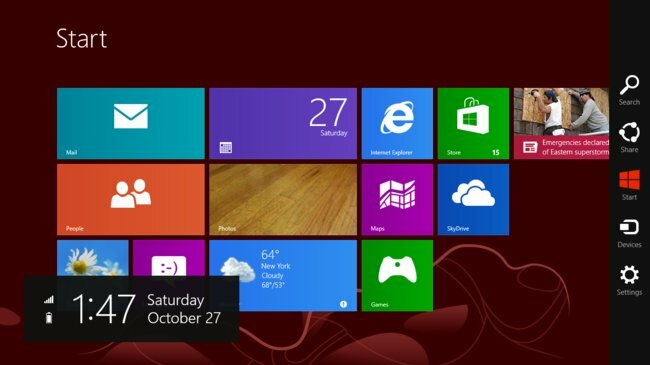 While I thoroughly enjoyed using Windows RT, and see huge things for Windows 8 moving forward, it became a dealbreaker when I was not able to use established apps I use regularly on my Windows 7 ultrabook or even apps that I use regularly on my Android or iOS devices. 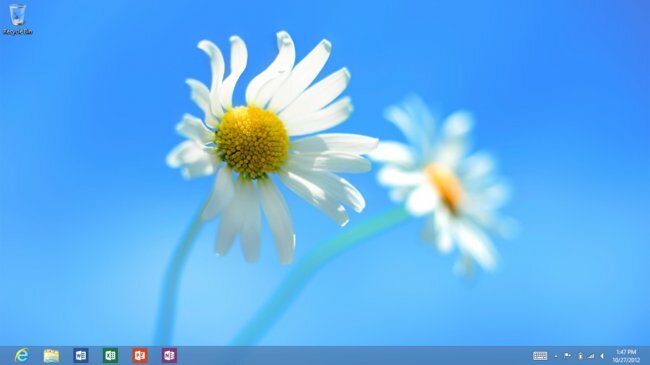 I loved the familiarity of Windows, the controls of Windows, and the new interface Microsoft introduced is fantastic. Unfortunately, the lack of legacy applications makes that moot. Despite a fantastic design, the tablet is large, which makes regular tablet activities somewhat of a pain, as well. Overall, the Surface with RT gives me even higher hopes for the upcoming Surface Pro, which will run on an Intel chip and will have support for all legacy Windows apps. This tablet, despite being heavier, I believe will be a game changer in the market, as long as Microsoft doesn't price it out of the range (which is entirely possible). Unfortunately, we have to wait until next year. I suggest you revise the ecosystem rating. You completely neglect the fact that, unlike those of other OS, Surface can interface with almost any existing device you can think of - printers, mice, keyboards, your 2TB external hard drive, 8GB stick, etc. thanks to its Windows code base, the USB port, and Bluetooth 4.0. Syncing with Homegroup and network also means you can stream music without the extra hassle of additional software. Smart Glass, Game app, and Music app work together. You can also multitab. I'm not worried about the current Apps environment. It's going to grow as people can port their code without as much as hassle as for other operating systems. I'd say yours is a good, fair review, based on the limited interest I've had in the tablet up til reading it. 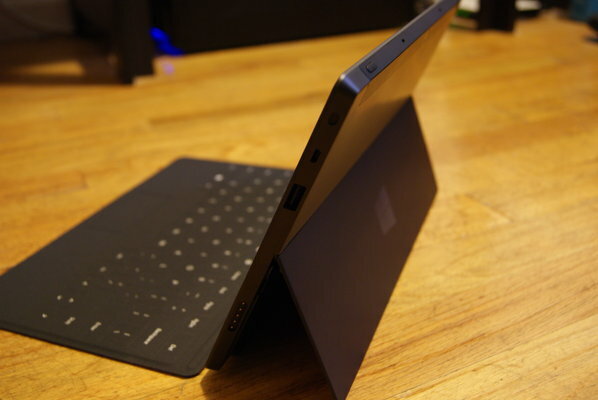 Slightly off topic - you mention that you 'have been looking to replace [your] current ultrabook with a tablet hybrid'. Why? I'm not narrow minded when it comes to technology but I can't imagine a tablet being an acceptable replacement for an ultrabook, yet. Practically speaking, to use your review/this tablet as an example, you say it's quite large and awkward, which defeats the purpose of a tablet in my opinion. But then it obviously also falls down in areas like performance and storage, which I think would ultimately prove restrictive if its purpose is as a replacement for an ultrabook. To put my point in to a bit of context, practically speaking, how is setting up a kickstand and docking to a somewhat flimsy looking keyboard ultimately any more convenient or advantageous than just carrying an 11/13" ultrabook with you? I suppose I'm interested in your opinion on where you'd be willing to compromise/why you'd want to. I think this is a good review. It is on point. Just a couple of things. I don't think the reviewer realized you can flip the cover around and use the device as a tablet without removing the cover. This is very nice on the go. There is no need to use the keyboard or kickstand in my lap. If I need the surface in my lap, I use it like a tablet and flip the cover over. It doesn't take any fun out of having a tablet. There is also an onscreen keyboard that pops up in this mode, just like you would expect on an iPad. Also, other browsers are not blocked. Google can make a metro chrome app anytime they want. I must say as a Firefox user, I'm kind of liking IE10 in metro mode. Anyway, great review! It was pretty fair unlike most reviews I have read. Surface has defined at least two new parameternya of tablet review where other tablets are not capable of : Connectivity and scalability. It is a main thing that differentiate Surface from other "game toy and web brower" tablets. Surface has clearly put itself as serious productivity tablet without sacrificing the experience of using tablet for fun. I don't really understand the point of ecosystem value and how you measure it. Does more application mean better ecosystem for you although most of it just a so-so quality applications? I personally just need 10-20 applications on my iPad, and I believe that's the maximum number of application I need on my Surface. The best applications in its categories will be enough for me, and it's not 100,000 applications on the Apps Store or whatever you call it. Hi Rickg, I based that small caveat on Mozilla's own directors claiming Microsoft did not give Mozilla or Google access to the APIs that would allow them to make rival browsers. If that has changed, I would be very excited. Ripper, I'm looking to replace my ultra with a tablet hybrid for the reasons stated. Better battery life, weight and a touch interface. Also don't want to pay $1000+ :) I believe the Surface Pro will be that device. There will be downsides of course, like some portability issues and the internal storage size, so I will have to consider when that time comes whether its the right decision. TwistyP, I completely agree with the pros of your comment. I did not test out streaming from a home PC to the tablet, but did test external hard drives/flash drives, which worked perfectly and is vastly superior to iOS and Android. No qualms there. However, not having access to the legacy apps of Windows is a big downside, as is the lack of apps available to other tablet owners. I understand that MS said that it would be a replacement for a traditional windows computer being more geared to the Pro than the RT. And while I understand you have issues with it not being able to run legacy apps, it has more to do with the app creators than it does Windows as those apps were not written for arm based windows. Which is more of a physical limitation that windows couldn't really overcome. I know you've mentioned it but once there is time for the environment to grow and get bigger. You will start having access to some of those legacy apps you miss. I think its important to look at the RT as a tablet than a computer alternative. And if you look at it that way, I personally feel that everything it offers like usb port, desktop mode, etc. At the same price as the iPad makes it a superior tablet. But all in all it was a very fair very reasonable review and I always enjoy your posts. Thanks. The problem you're not seeing, is that the Surface RT does not allow installation of any program, except from Windows marketplace, PERIOD. No side-loading for you! The Surface RT is essentially the toy version of the Surface Pro. The comparison is inescapable. And that's different than Apple forcing people to install programs for the AppStore... how? I believe that Microsoft has taken too long to bring this to market and they should not have limited users to connect to different apps eg. Chrome and Google. I guess that's the difference between Google and Microsoft. Microsoft is scared. Who said it was any different..? While you can at least jailbreak an iOS device, unlike the Surface RT (so far), I don't like this "feature" of either ecosystem. Just because another manufacturer pulls the same BS, doesn't make it OK. I have been looking to replace my current ultrabook with a tablet hybrid that has superior battery life, a touchscreen, and can also live up to the productivity needs of my everyday life. i am more than confident to say that a tab will NEVER replace a laptop; however, a tab with a great battery life, smooth touchscreen, capable productivity software can make me much more comfortable on-the-go. i will happily buy this kind of tab as long as i can hold it in one hand for reading (reading is the purpose of a tab rather than writing, IMO). unfortunately, heaviness of the surface and a relatively high price may kill the deal. I went to our local Microsoft Store on Friday to check out all the hulabaloo. I was very impressed. 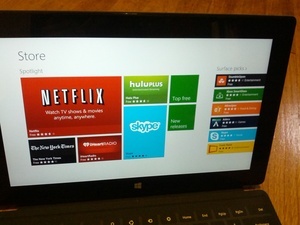 Not just with the Surface, but there was a very impressive variety of touch-screen enabled Win 8 devices. Some were a better fit for my needs than others, there was a nice variety. Using the Win 8 UI with touch-screen was very nice. The Surface in particular is a very impressive device. I'll probably get RTs for my wife and kids for Christmas, and hold out for the Pro version for myself. Our laptops are old and dying, and these are nice upgrades. Nice article. I just don't see this as a desktop replacement for me. A laptop replacement for some folks sure, but as you stated- no side loading - Apps from only pre-approved M$ market, it just seems a bit draconian & counter intuitive to my particular workforce. Having already seen an older laptop preloaded with (what I perceive to be) a pre release version of 8 on it has already led me to believe that Windows 8 is heavily reliant on the touchscreen market. In it's initial start up of course & a continued propensity to return to a home menu screen reminiscent of all our smart phones/tablets. Not exactly what i was looking forward to in a new 'computer' operating system. However, a screen of this size needs at least 1080p and it's not there. Utter rubbish... I challenge you to find a PC monitor below 19 inches, with a 1080p resolution. Why aren't there any? Because there is no need for them. The iPad 1 and 2 work perfectly fine, on a similar sized screen, with an almost identical resolution. This resolution nonsense is exactly that... nonsense. Read up on UI element scalability, and UI interaction fundamentals... or spend 26 years professionally designing software and UIs, like some of us have. And just because YOU don't like it, doesn't make it unacceptable. Opening the doors, would just end up with the plethora of amateur written tripe, that fills the Android market. That's because you ONLY use tablets (TABS are a UI element) for reading, and not creating. It's the difference between "consumption toy (iPad)", and "productivity tool (Surface)". Toys or tools, each have their own market. Well, if you are a "newbie" then I guess that philosophy is fine. Trouble is most people have apps they use, and utilities, etc. and not being able to use them is going to be as big of an issue as Windows Vista/7 64 bit OS. In addition, I tend to agree that the form factor is good, but why limit it to a 720p display? larger screen and the 720p looks worse than if they went 7 or 9 inch screen. BTW - backward compatibility implies no existing office license would work? 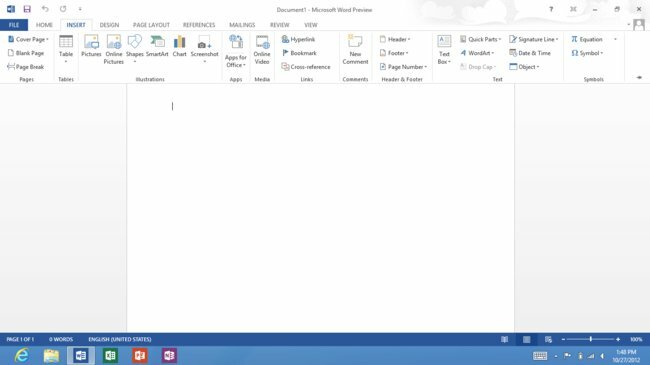 wow that is nice....belly up to the Microsoft office bar YET AGAIN! wow....so many bad choices here. Apple and Google have to be loving this. Of course my not liking something is what makes it unacceptable; what gives you the impression that I was speaking about anyone's acceptance but my own?. YOU don't get to define that for me, sorry. I don't particularly understand how you think you could. What, you're going to stand over me with a stick and try to force me to accept it..? Absolutely no need to make this personal people! This is one man's opinion. He is entitled to it as others are to theirs. Here's something I heard from my elders as a kid. "You can please some of the people all the time, you can please all of the people some of the time but you can never please all of the people all of the time!" This has served me well in life. Maybe it will do the same for some of you. Notwithstanding, personal preference is the basis of which we get innovation and competition. Some are going to think MS to be geniuses and some, utter fools! Personally I tend to side with the review. Not having legacy apps is a big deal! I love Google and Google Chrome. Being forced to use proprietary or MS approved is very un-MS like. I'm from the school of if it's not broken don't fix it. Seems to me MS has become afraid of competition, moreover, they've probably gotten tired of being sued and think this is the best option to avoid it...customers and developers be damned...ehem...so to speak. Maybe they think this destroys the competition! Time will tell. I'll do what I always do...wait and see how things go. I'll be one of the late comers who patiently waited for things to be more to my liking and if not, well then I didn't miss anything and I saved a great deal of money! "In all your getting, get an understanding!" You do realise that this is not based on x86 architecture processor. You would know the significance if you ever worked with Windows CE PDAs and handheld PCs. The applications had to be compiled with a suitable software to suit the processor used as also per the hardware. You just have to give time to YOUR application vendors to come up with the suitable versions. For all these people complaining about the lack of Legacy apps, do you own an iPad? RT has just as much support for legacy apps as the iPad does. (i.e., none.) But, unlike the iPad, it has support for Office. Most of the complaining about the Surface RT seems to be of the sort, "It doesn't do something that the Surface Pro does." Which is a legitimate reason to get the Surface Pro, but not a legitimate reason to suggest that the Surface RT lacks the sort of technical prowess that made the iPad successful. 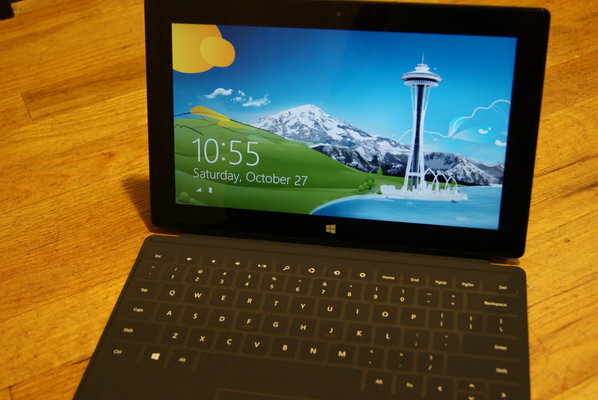 Despite all the naysaying, Surface RT and Windows 8 have sold quite well in their first week on the market. And the 5% increase in Microsoft's stock price over that same time confirms that the market is reacting well to the direction Microsoft is headed. First off, there hasn't been much mention of the iPad in this thread, so far, except for certain direct comparisons. - Completely closed ecosystem, unless you violate your ToC and warranty, and jailbreak the device (not possible for the Surface RT yet). - Lack of software options, beyond those officially "blessed" by Apple or M$. The browser fiasco is only the beginning for RT. As I noted above, you can damn well bet you will see just about *zero* open source/GNU GPL licensed software on the Surface RT, for the exact same reasons you don't find them in the Apple Store. Open source and closed markets do NOT mix, and M$ has always hated open source anyway. - Overemphasis on "cute" and aesthetics over function. I have enough toys, thank you. I'm also extremely put off by the requirement that Metro apps run full screen. Quite a few developers are already actively (and publicly) refusing to develop/recertify software for Win8, especially the RT branch. And last, yes, most of us are likely aware of the differences between the RT and Pro versions of Win8. A lot of consumers, however, are *not*. You can damn well bet there's going to be a serious brouhaha when those poor saps realize that many, if not most, of their legacy applications not only don't run on RT but never will.